The destruction wreaked on Haiti by Hurricane Matthew earlier this month has caused the United States to quickly revisit its toughened policy toward the thousands of Haitian nationals who are arriving at the California-Mexico border without prior authorization to enter. 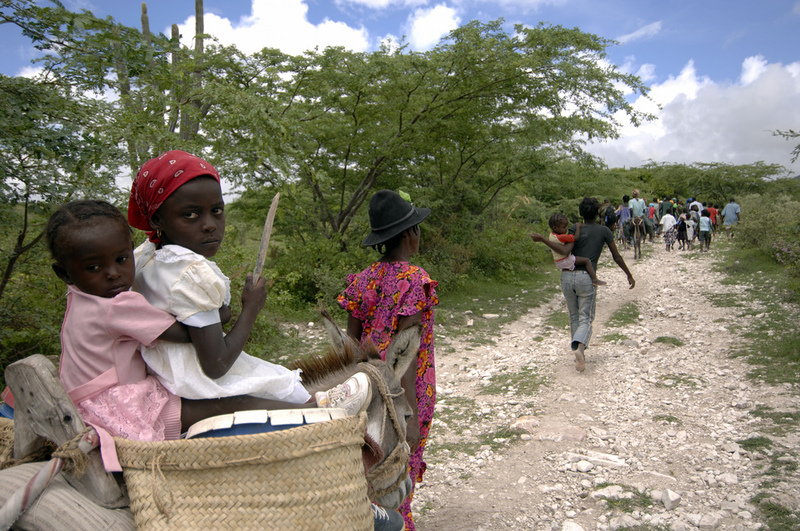 Following a recent dramatic surge in arrivals of Haitians, dubbed an “emergency situation” by U.S. Immigration and Customs Enforcement (ICE) Director Sarah Saldaña, the Department of Homeland Security (DHS) in September announced it would resume regular removals to Haiti for the first time since a devastating earthquake struck in 2010. But in the aftermath of the latest natural disaster, with the hurricane killing at least 1,000 people and ravaging communities across Haiti, DHS quickly reversed that decision, again suspending deportations to Haiti—though making clear flights will resume when conditions improve. Prominent lawmakers and advocates for Haitian immigrants are calling for the Obama administration to do more, and further extend Temporary Protected Status (TPS), which provides relief from deportation and eligibility for work authorization. In January 2010 a catastrophic earthquake hit Haiti, killing an estimated 160,000 and displacing nearly 1.5 million others. To make matters worse, ten months after the earthquake a cholera epidemic broke out along Haiti’s largest river, later determined to be the result of leaked waste by a United Nations peacekeeping mission. The epidemic spread across the beleaguered, impoverished country, killing nearly 10,000 and infecting almost 800,000 others. A little more than a week after the earthquake, DHS designated Haiti for TPS, allowing Haitians who were already living in the United States to apply. Then-Homeland Security Secretary Janet Napolitano extended and expanded TPS for Haitians in May 2011, allowing those who had arrived in the United States up to one year after the earthquake to also receive protection from deportation. That designation expires in July 2017. About 50,000 Haitians had been granted TPS as of February 2016, according to the Congressional Research Service. Separately, the day after the earthquake struck, ICE announced it would also suspend removals of Haitian nationals. Under this policy, even Haitians not covered by TPS would not be deported. A little more than a year later, ICE resumed limited deportation of certain Haitian noncitizens—those with final orders of removal or who had been convicted of a serious crime or posed a national security threat. The policy was also applied to new arrivals. Haitians arriving at the border without a lawful basis to enter the United States were placed by U.S. Customs and Border Protection (CBP) officers into longer-term removal proceedings and permitted to enter the country pending completion of such proceedings. This was a major departure from the standard procedure, under which inadmissible foreign nationals are placed in expedited removal and detained until removed. By not placing Haitians in expedited removal, CBP avoided having to detain Haitians for years, until the suspension on removals was lifted. In a further revision, most Haitians arriving at the border since early summer 2016 were allowed to enter on humanitarian parole and permitted to stay for up to three years. Parole is an exercise of executive discretion that allows lawful entry and permission to stay for a temporary period. DHS has not released estimates of how many Haitians were permitted to enter since the nonremoval policy was put in place, or how many were granted humanitarian parole. Between 2011 and 2014, 5,801 Haitians were found inadmissible at the border, according to DHS; this is a good proxy for the number permitted to enter pending the completion of their proceedings. After the 2010 earthquake, large numbers of Haitians also began emigrating to Brazil. For the most part, Brazil welcomed the arrivals, as it needed workers for its growing economy and for the construction buildup surrounding its hosting of the Olympic Games and World Cup. In the two years after the earthquake, 4,000 Haitians made their way to Brazil. Many more were granted humanitarian visas, a new visa category created by Brazil in order to facilitate the arrival of Haitians. The visa is valid for five years and allows Haitians to work lawfully. With the assistance of the International Organization for Migration (IOM), Brazil opened a visa center in Port-au-Prince to facilitate expedited visa issuance to Haitian nationals. For those inside the country, the Brazilian government established another new category of “permanent humanitarian visas,” which allows Haitian nationals to stay and work in Brazil for an extended period. The Brazilian government announced in November 2015 that it had granted such visas to 43,781 Haitians who had originally arrived without authorization. Economic downturn, political crisis, and the dip in construction jobs after the Olympics served to make Brazil less desirable to Haitians there, with increasing numbers setting their sights on the United States. There has been a dramatic increase in the arrival of Haitians at the U.S.-Mexico border, the vast majority coming from Brazil. Since last October, more than 5,000 Haitians without visas have arrived at the San Ysidro crossing between Tijuana and San Diego, a sharp uptick from 339 during fiscal year (FY) 2015. About 90 percent departed from Brazil and made the long journey by land through Central America and Mexico, based on anecdotal observations by various organizations in the region. U.S. Border Patrol officials were so overwhelmed by the flow that they implemented a unique appointment system, under which arriving Haitian nationals were given future dates to return for processing. In the meantime, the migrants waited in Tijuana, overfilling local shelters. Testifying before the House Judiciary Committee in September, Saldaña estimated that another 40,000 Haitians were en route to the United States, citing intelligence from Honduras, Guatemala, and El Salvador. Homeland Security Secretary Jeh Johnson on September 22 announced that deportations of Haitian noncitizens would resume since conditions in Haiti had “improved sufficiently to permit the U.S. government to remove Haitian nationals on a more regular basis.” In a separate conference call with reporters, Homeland Security officials acknowledged that the increase in arrivals at the border was the other major factor that led to the decision. Under this revised policy inadmissible Haitians arriving at the border—like other national-origin groups—would be placed in expedited removal proceedings and no longer be systematically permitted to enter the United States. Consistent with U.S. law and practice with other migrants, Haitians expressing a fear of return to Haiti would be screened for eligibility for asylum or other forms of relief. An unintended consequence of the recent policy change to resume deportations has been the separation of families. The appointment system used by CBP gave priority to women and children so they were not forced to spend weeks in overcrowded shelters in Mexico. This meant women and children were permitted to enter the United States ahead of their partners and fathers, and that those men were effectively shut out if they did not get into the United States before the change in policy. While DHS and the State Department worked with the Haitian government to resume removals, there has been no evidence that Haiti has agreed to cooperate. Indeed, the U.S. government has had trouble deporting Haitians since its April 2011 decision to resume removals of individuals with criminal convictions. The Haitian government was selectively accepting only 50 deportations per month, with frequent denials. Under current practice, when individuals are subject to final orders of removal but there is no significant likelihood that a removal will occur, there are limited situations in which DHS may continue to detain them long term. In most cases, such individuals qualify for release subject to orders of supervision, under which they must regularly report to ICE. The refusal of Haiti to accept repatriation of its nationals became a subject of intense political controversy earlier this year, when a Haitian national with a final removal order was convicted of murdering a U.S. citizen. Jean Jacques illegally immigrated to the United States from Haiti in 1992, but later served 17 years in prison for his involvement in a 1996 shooting. After being released from prison, Jacques was ordered removed, but Haiti claimed there was insufficient documentation to establish his citizenship and rejected his repatriation three times. After being released on an order of supervision, Jacques was convicted in the stabbing murder of Casey Chadwick, a 25-year-old Connecticut woman. In response, a bipartisan group of senators introduced the Remedies for Refusal of Repatriation Act, nicknamed “Casey’s Law.” The legislation would require the State Department to exercise its authority under current law and notify governments that refusal to accept return of their nationals may result in their citizens being denied visas to enter the United States. On October 4, Haiti was devastated by Hurricane Matthew, and an estimated 175,000 people are living in temporary shelters. Immediately after the storm the country again began to see an uptick in cholera cases. Haiti is ruled by an interim government that is ill equipped to meet the challenges posed by the disaster. Confronted with the devastation, Johnson announced the temporary suspension of flights with deportees to Haiti less than a month after they had resumed. However, Johnson made clear that arriving Haitians will be placed in expedited removal proceedings and will remain in detention until such flights are resumed. In the meantime, there have been growing calls to redesignate Haiti for TPS, including by New York Senators Charles Schumer and Kirsten Gillibrand, as well as a dozen other senators. The administration has yet to announce if it will accede to the request. Advocates for TPS for Haiti argue that the post-hurricane situation presents a classic case for designation, granted for countries deemed unsafe for repatriation due to ongoing armed conflict, the effects of a natural disaster, or other circumstances. Thirteen countries are currently designated for TPS: El Salvador, Guinea, Haiti, Honduras, Liberia, Nepal, Nicaragua, Sierra Leone, Somalia, Sudan, South Sudan, Syria, and Yemen. Nationals of Honduras and Nicaragua have received TPS in the past because of hurricanes. As the United States struggles with its obligations in response to the new flow of Haitian nationals, some have argued that Brazil shares responsibility—at least with respect to Haitians who have the right to stay and work in Brazil for an extended period. Under U.S. immigration law, foreign nationals are permitted to designate a country to which they will be removed. The U.S. government may disregard the designation if the country does not agree to accept the individual, or if it decides the removal is prejudicial to the United States. But there is no international framework or guiding principle for countries regarding their responsibilities toward individuals who are not nationals but have been granted permission to stay for an extended period. Thus removals of Haitians who wish to return to Brazil would only occur if both the United States and Brazil agree. Meanwhile, Haitians who were admitted prior to the September 22 policy change have begun resettling within the United States. Most have moved to Florida and New York, the states with the highest concentrations of Haitians. As they resettle, Haitians granted humanitarian parole qualify for some public benefits. The Refugee Education Assistance Act of 1980 allows Cubans and Haitians who were granted parole to qualify for refugee benefits and services, such as cash and medical assistance, as well as social services and Temporary Assistance for Needy Families. The law was passed at a time when disparate treatment toward Haitian and Cuban arrivals in the late 1970s had generated considerable public controversy. Today, the differentiated treatment between Haitians and Cubans remains a point of contention. Under the 1994 and 1995 U.S.-Cuba migration accords, any Cuban who reaches U.S. soil is paroled into the country. And under the Cuban Adjustment Act of 1966, Cubans are eligible for a fast track to permanent residency, while Haitians do not receive any comparable benefits. With the restoration of diplomatic relations between the United States and Cuba, many are calling for an end to the uniquely preferential treatment afforded Cubans under immigration law. Supreme Court Turns Down Obama Administration Request for Rehearing in Landmark Immigration Case. On October 3, the Supreme Court denied a Justice Department request to rehear United States v. Texas once the court has a full panel of nine justices. The request came after the court deadlocked 4-4 in June, leaving in place an appellate ruling that had blocked part of the executive actions announced by President Obama in November 2014. The ruling blocked actions that would have protected up to 3.6 million unauthorized immigrants from deportation through creation of the Deferred Action for Parents of Americans and Lawful Permanent Residents (DAPA) program and about 300,000 others through expansion of the existing Deferred Action for Childhood Arrivals (DACA) program. FY 2016 Arrivals of Central American Families and Children Reached FY 2014 Levels. During the fiscal year that ended September 30, arrivals of Central American families and unaccompanied children returned to levels seen during the 2014 surge. In fiscal year (FY) 2016, 137,366 families and unaccompanied minors presented themselves at the Southwest border, compared to 136,986 in FY 2014 and 79,940 in FY 2015, according to figures released by the Department of Homeland Security (DHS). The composition of this population, however, has changed: Apprehensions of unaccompanied minors decreased by 13 percent in FY 2016 compared to two years earlier, while apprehensions of families increased by 13 percent. United States Imposes Visa Ban on Gambian Government Officials. The State Department on October 3 announced that it would no longer issue visas to Gambian government officials and their relatives. The ban follows repeated failures by The Gambia to accept the return of nationals ordered deported from the United States. In a press release, the U.S. Embassy in Banjul said it would halt issuance of visas to government officials until travel documents are issued to all Gambians ordered removed from the United States. This is the first ban imposed on government officials of any country since 2001. It occurs amid increased political pressure on the State Department to take a firm stance against the 23 countries that routinely fail to accept return of their citizens in a timely manner. Supreme Court to Hear Several Immigration-Related Cases This Term. In the first weeks since the start of its new term, the Supreme Court has agreed to hear three immigration-related cases. In Beckles v. U.S., the justices will review a ruling by a federal appeals court in California striking down the definition of a “crime of violence” as too vague. Conviction for a crime of violence subjects a noncitizen to deportation. In Hernández v. Mesa, the court will review an April 2015 ruling by the 5th U.S. Circuit Court of Appeals which threw out a civil-rights claim against a U.S. Border Patrol agent who fatally shot a 15-year-old Mexican citizen from across the border in Texas in 2010. The justices also accepted and consolidated three related cases—Ashcroft v. Turkmen, Ziglar v. Turkmen, and Hasty v. Turkmen – which raise the question whether high-level government officials can be personally liable for policy decisions made in the exercise of their duties. The cases were brought by a group of mostly Muslim and Arab noncitizens who were detained at the federal Metropolitan Detention Center in New York for immigration violations in the years after the 9/11 terrorist attacks. The plaintiffs alleged that they were held in harsh conditions and physically abused. Washington Post article on Beckles v. U.S. Temporary Protected Status Extended for Nepal and Due to End for Guinea, Liberia, and Sierra Leone. On September 22, Homeland Security Secretary Jeh Johnson announced the extension of Temporary Protected Status (TPS) for Guinea, Liberia, and Sierra Leone through May 21, 2017 for the purpose of orderly transition before the designations terminate. The three countries were designated in November 2014 following the outbreak of Ebola in West Africa. Finding the widespread transmission of the Ebola virus has ended, Johnson determined that conditions in the countries no longer support the designation, which provides relief from deportation to nationals of designated countries and eligibility for work authorization. Secretary Johnson also announced the extension of TPS for Nepal through June 24, 2018. Nepal was designated in June 2015 after a severe earthquake hit the country. In a separate memorandum issued September 28, President Obama extended Deferred Enforced Departure (DED) for Liberians, which offers protections similar to those afforded to TPS recipients. The extension will run for 18 months, effective October 1, 2016. Liberia is currently the only country covered by DED. Federal Court Nullifies Ability of ICE Chicago Field Office to Send Detainers to Local Law Enforcement. On September 30, the U.S. District Court for the Northern District of Illinois invalidated the federal practice of issuing detainers against noncitizens held in state or local custody who are targeted for removal. U.S. Immigration and Customs Enforcement (ICE) issues detainers to ask state or local officials to hold the noncitizens until they can be taken into custody by the agency. The court ruled in Moreno v. Napolitano that the practice exceeds the authority of the government to arrest people without warrants under federal immigration law. The decision affects only detainers issued by ICE in Illinois, Indiana, Kansas, Kentucky, Missouri, and Wisconsin, states that come under the jurisdiction of the ICE Chicago field office. Texas Withdraws Appeal Over Syrian Refugee Resettlement. On October 7, Texas dropped its bid to block Syrian refugee resettlement in the state. Texas had sued the federal government in December and twice was denied temporary restraining orders to prevent refugee resettlement. In June, a federal court dismissed the lawsuit, ruling that states do not have the power to enforce the consultation requirement under the Refugee Act of 1980. The state appealed that ruling to the 5th U.S. Circuit Court of Appeals, and the following month withdrew its appeal. A week earlier, Texas Governor Greg Abbott announced that his state had officially withdrawn from the U.S. refugee resettlement program. However, refugee resettlement will continue to occur in Texas without the participation of the state. When states opt out, resettlement is managed exclusively by nonprofit organizations through a federal Office of Refugee Resettlement (ORR) program called Wilson-Fish. ORR currently funds Wilson-Fish programs in 12 states: Alabama, Alaska, Colorado, Idaho, Kentucky, Louisiana, Massachusetts, Nevada, North Dakota, South Dakota, Tennessee, and Vermont. Recently, the governors of New Jersey and Kansas also took steps to withdraw their states from the refugee resettlement program. Appeals Court Rules Against Effort by Indiana Governor to Block Syrian Refugee Resettlement. The 7th U.S. Circuit Court of Appeals in Chicago on October 3 unanimously affirmed a lower-court ruling that blocked Indiana Governor Mike Pence from barring state agencies from participation in the resettlement of Syrian refugees in his state. Citing “terrorism concerns,” Pence, now the Republican vice presidential nominee, in 2015 issued a directive to all Indiana state agencies suspending resettlement of Syrian refugees. He also indicated that state agencies would refuse to reimburse nongovernmental resettlement organizations that assist such refugees, including Exodus Refugee Immigration. Exodus then sued Pence and the state, citing equal-protection and civil-rights violations. A federal district court sided with Exodus in February, ruling that the order violated Title VI of the Civil Rights Act of 1964, which forbids discrimination on the basis of national origin in federally funded programs. Pence was one of 31 governors who issued statements opposing the resettlement of refugees in their states.